The Colors Of Indian Cooking: Sweet, Light, and Crunchy, Meringues Are Summer Berries' Best Friend, and Naturally Gluten Free. Sweet, Light, and Crunchy, Meringues Are Summer Berries' Best Friend, and Naturally Gluten Free. There are so many things one can screw up in cooking some dishes that a lot of people just don't go there. Everybody who cooks has one or two foods that they love but just don't dare to attempt. Usually with good reason. Ask me about the time I thought that cream puffs would be a great idea for our July 4th cookout. Just ask me, as I blew my way through 3 dozen eggs and wound up with a flattened mass of chewy pate a choux poker chips, if I'm ever going to try that again any time soon. I haven't. People tell me, well, actually nobody told me, but I've read online, that making cream puffs is the easiest thing in the world. Yeah sure. It's something I might try again some day but who likes failure? 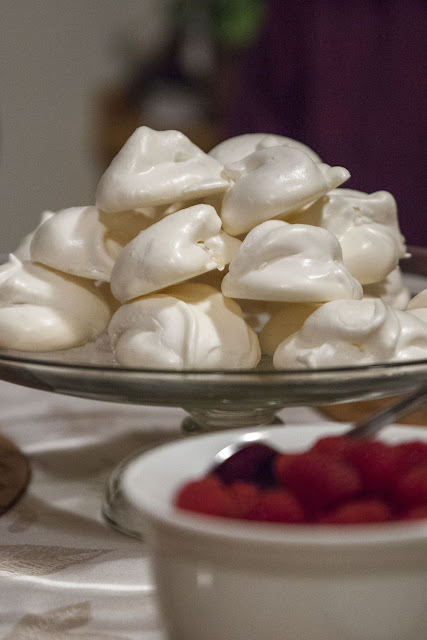 Then there was the time I attempted to make the classic floating island dessert, or as I called it the Floating Island of Lost Souls...."Are we not Meringues?????" No, most definitely we are not. So much for the Floating Island. The reason I thought I could get away with this dessert was that I had made meringues, or rather meringue aka Pavlova many many years ago. In fact I used to make it pretty frequently for parties and as a Summertime dessert. Here's a pretty classy looking Pavlova, not made by me. 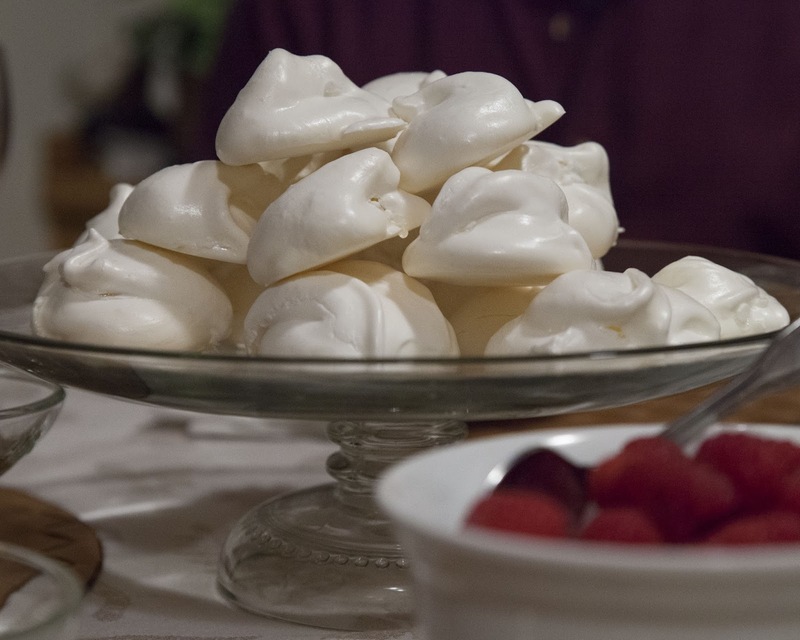 This is the Wiki version of Pavlova, mine were a bit more "free-form." Anyway it's been a long time between meringues for me which started me thinking. Maybe it was time to do the Meringue again. I'm not talking about the dance though, which is the Merengue. I was having enough trouble with egg whites. But then something happened. I'd made Chocolate Olive Oil Ice Cream to be served with some Stout Caramel and suddenly I found myself with a whole lot of left over egg whites. It seemed it was in the cards that I try doing meringues once more. This time instead of one big Pavlova, I wanted to make smaller individual meringues to be served with fresh berries. 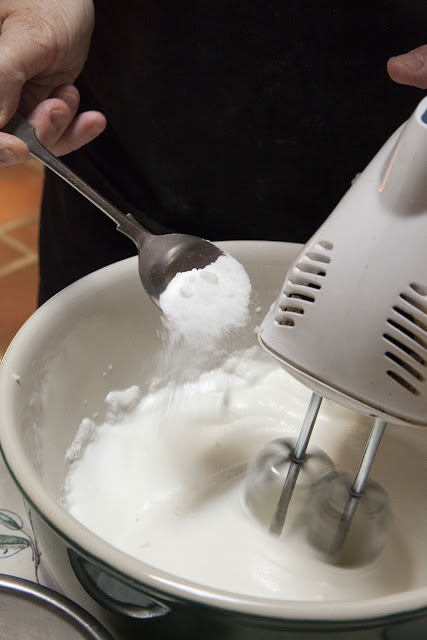 My grandmother on my mom's side, excelled in meringue baking and I always remember watching her use her big standing mixer to make what she called "angel kisses." Of course I'd never made the small individual cookies, and that started me researching into what makes the best meringues. Or maybe I should just say researching how to whip egg whites without screwing it up. As it turns out there are a few very basic rules one should always obey. 1. It's easier to separate egg yolks from whites when the eggs are cold. Make sure no yolk gets in the whites.They won't whip up if there is any grease of fat in them. 2. Always allow your egg whites to come to room temperature before beating them. Let them sit for about 30 minutes or so. Allowing the whites to warm up makes the whipping time faster and allows more volume into the whites when you beat them. 3. 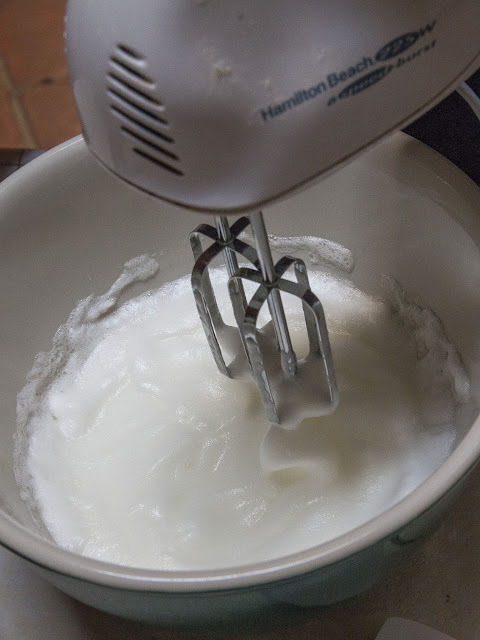 This sounds nuts but if you've had egg whites sitting around in the fridge for about 3 days, that's the best time to whip them. Older egg whites get thinner and that makes beating them easier. Also, older egg whites equals more volume. People talk about stability, and fresher whites supposedly give one more stability but I did it both ways as an experiment last week and frankly the older whites worked better for me. 4. Whip them in a glass or stainless steel or copper bowl. Plastic is no good because it may have traces of grease on it. The same goes for the utensils you use in whipping. 5. 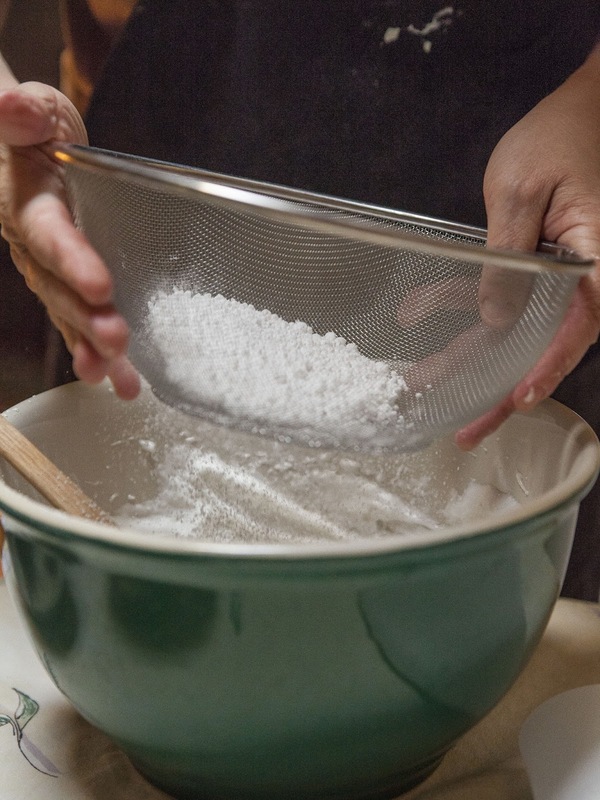 Whip the whites first, then when they form soft peaks, add the sugar a bit at a time. Doing this prevents the meringues from "weeping." This doesn't mean they're sad, but it does mean they're depressed and will sink and collapse, ooze sugar and stick to the parchment paper when you try and remove them. This is needless to say not good. 6. If it's rainy or super humid don't even go there. Wait for a drier day to bake meringues. 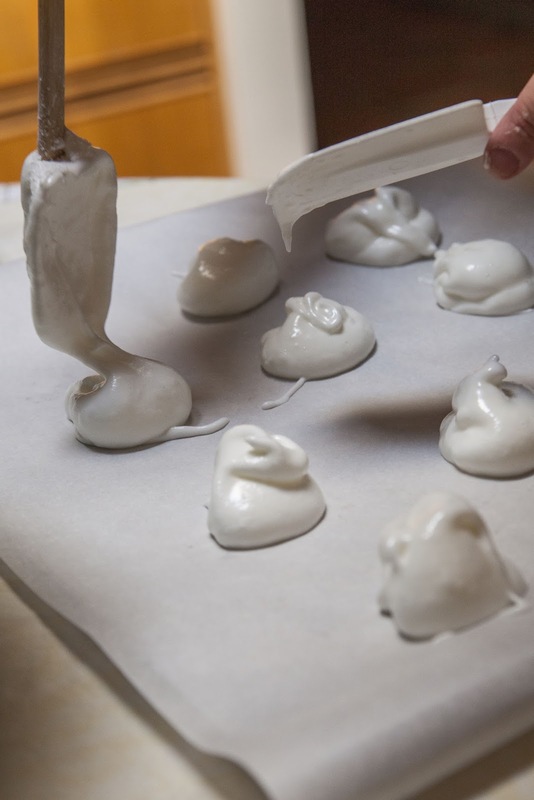 Since meringues are all about absorbing and folding air into egg whites, moist air is not good. Okay. Meringue school dismissed. Lets get whipping. Preheat the oven to 212 degrees. 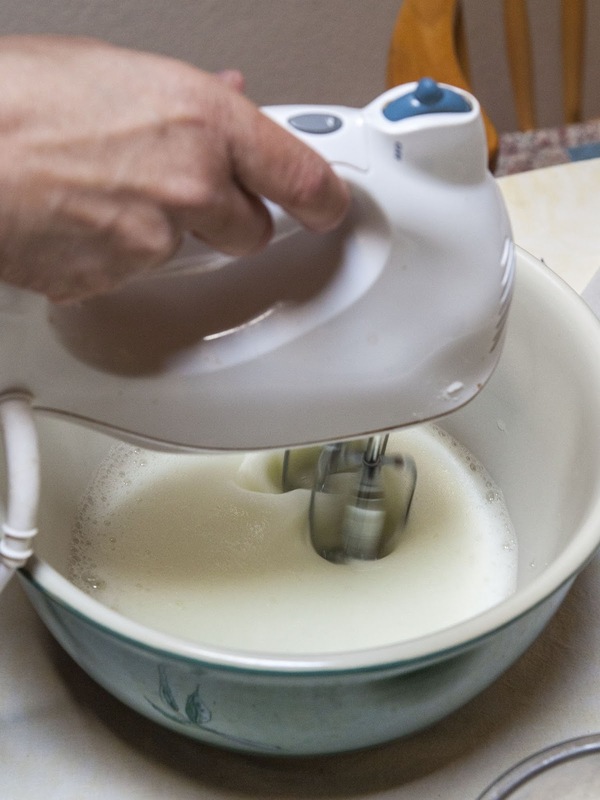 Put the egg whites into a large, clean, dry, mixing bowl. Beat the egg whites on medium speed. Do this until they start to form soft peaks. Turn the speed of the hand blender up and add in the superfine sugar about a teaspoon at a time. 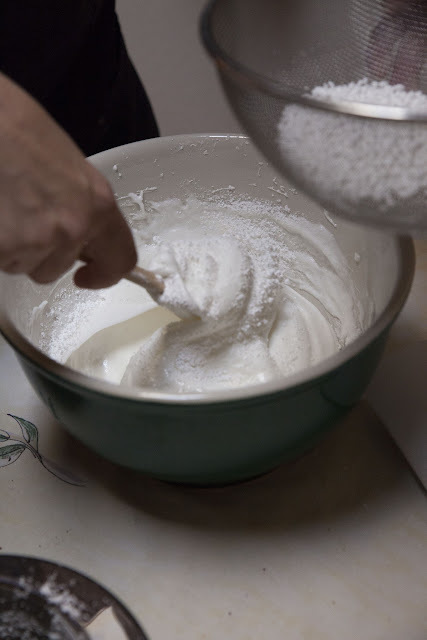 After each teaspoon, whip it for about 4 seconds or so to make sure it's incorporated, adding the sugar slowly makes sure you don't get weepy meringues. Remember you also do not want to over beat the egg whites as that will cause them to break. When it's ready, the egg whites should look thick and shiny. Now, turn off the beater. You are done with it. Sift the powdered sugar into the egg whites 1/3 at a time. 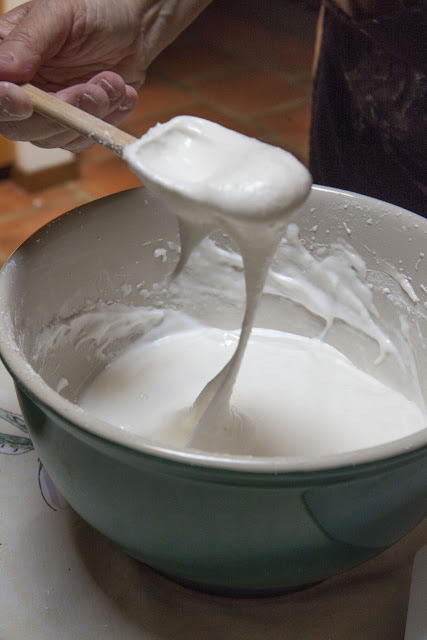 Fold it gently into the mixture with a spatula or big spoon. Again, be careful about over-mixing. You want it to look all pillowy and fluffy and hold its shape straight up. Scoop up spoonfuls of the fluffy meringue and gently deposit it on the parchment-lined cookie sheet in small mounds. Pop them into the oven and bake them for about 1 and 1/4 to 1 and 1/2 hours. 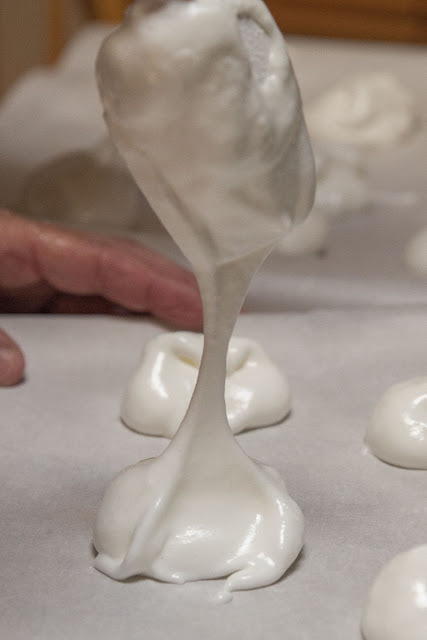 When they're properly done, the meringues will sound crisp when you tap them on the bottom . Let them cool on the trays, or you can move them to a cooling rack.